Wine and small bites are a match made in heaven, as are snacking and imbibing during the holiday season. Giving the gift of a bottle and some petite treats this year is guaranteed to bring joy, and we won't rule out peace on earth, either! 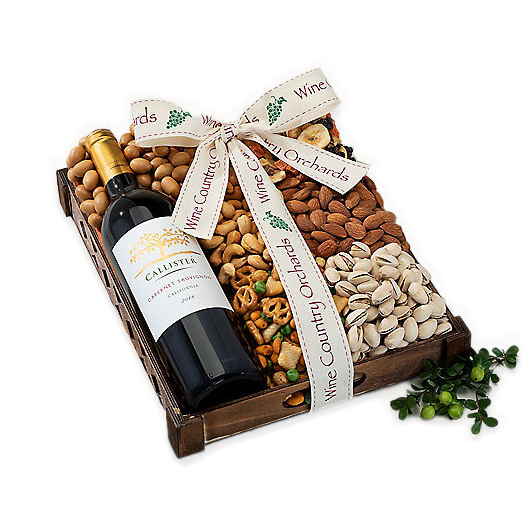 A bottle of rich Cabernet Sauvignon (750ml) is perfectly accompanied with sumptuous Toffee Peanuts, Roasted & Salted Cashews (3.5oz) and even more. Sip and snack comfortably this year with the Traditional Treats basket.